This report examines the structure of Community Benefits Agreements and the process for developing them in Ontario. It describes leading examples, the current policy landscape, and related strategic considerations. Over the next decade, Ontario will invest billions of dollars in infrastructure ranging from transit expansion to new roads and repairs to existing bridges. Cities and towns across the province will also see an influx of public and private capital in land developments designed to meet housing demand and build up underused areas. All of these investments are poised to create substantial new wealth and strengthen the provincial economy. At the same time, many Ontarians may not share in the prosperity generated by these investments. Income inequality is increasing in the province as it is elsewhere in the Western world. In many larger cities like Toronto, this inequality among individuals is often marked by a growing gap between high- and low-income neighbourhoods. Many jurisdictions are exploring a suite of policy approaches known as “community wealth building” in response to these trends. Community wealth building strategies differ from traditional approaches to poverty reduction by putting a focus on the community in market activities like institutional purchasing or infrastructure construction. They include building community assets, increasing the local capacity for business incubation, and creating decent work as a means to sharing prosperity more broadly and equitably. Community Benefits Agreements (CBAs) are a strategic tool used in the process of building community wealth. CBAs are negotiated agreements between a private or public development agent and a coalition of community based groups. This coalition may include neighbourhood representatives, single-issue advocates, labour unions, social service agencies, religious congregations, faith-based groups and others. Together, they give a voice to people in infrastructure planning and land development processes – especially those indviduals who have been historically excluded or marginalized from these processes and decisions that affect them. Coalitions usually draw their membership and build their base for advocacy from neighbourhoods directly surrounding significant projects. Spurred by a concern for the concentration of poverty in their neighbourhoods or cities, they seek to maximize economic opportunities offered by development projects – particularly those subsidized with public funds. This paper explores CBAs attached to large-scale real estate or infrastructure developments. It situates CBAs firmly in the Ontario context. It looks to the experiences of practitioners in other jurisdictions for lessons and cautions. It also considers how community organizers, public servants and developers can adapt this approach to their current realities. The paper examines the structure of CBAs and the process for developing them. It will describe the leading examples, the current provincial landscape, and related strategic considerations before drawing some conclusions and identifying next steps. 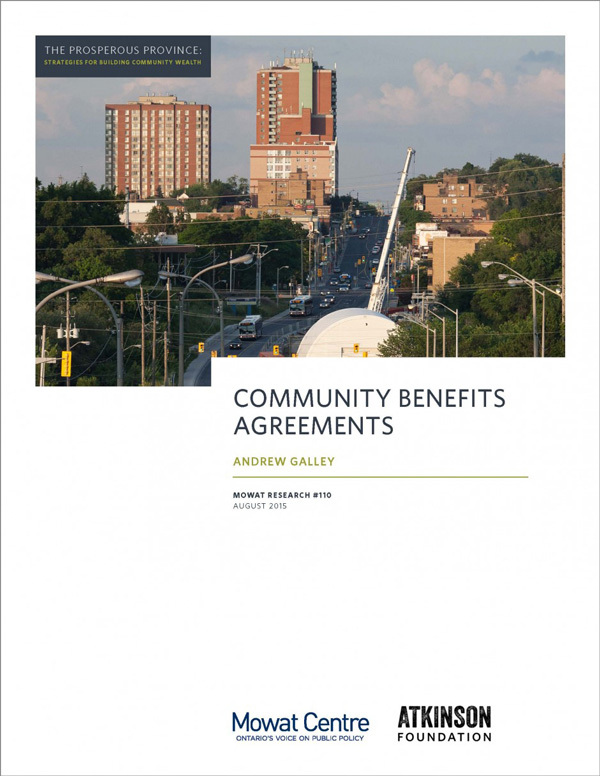 It is timely research because Metrolinx and the Toronto Community Benefits Network have signed a Community Benefits Framework derived from the community benefits agreement model. The framework is a first for Ontario and is bolstered by significant signs of support for this strategy in provincial government policy, starting with the 2014 budget’s infrastructure pledges and more recently the inclusion of community benefits in the passage of Bill 6: Infrastructure for Jobs and Prosperity Act. The Toronto Star reported in June 2015 that, “the new law, which will guide $130 billion in new provincial infrastructure construction over the next 10 years, includes a framework for so-called ‘community benefits agreements’.” The bill requires the public sector to consider community benefits when making decisions about infrastructure investments, and could usher in a new era of public, private and community collaboration to close widening divides in income and wealth across the province. It was the product of many months of advocacy on the part of a broad coalition including the Toronto Community Benefits Network and its partners in labour, philanthropy, business, academe and other community-based organizations.